In a move that leaves every person who has ever been to a Cracker Barrel aghast, two people made off with $158 in merchandise from the old country store yet left behind the wheels of cheese, butter churns, and large checker board pieces that you played on a quilt. 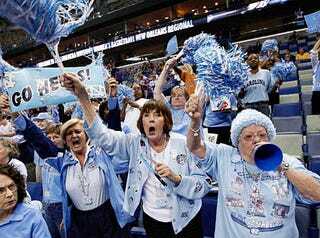 Instead they filched North Carolina (mostly) and Duke merchandise. Yep, this combines ESPN's favorite rivalry with Mike Patrick's favorite down home cooking. They took a UNC Tar Heels water pitcher that sells for $29.99, a Tar Heel cookie jar worth $39.99, a UNC T-shirt ($19.99), a Carolina clock ($29.99) and a UNC platter and soft basketball ($24.98), according to an affidavit. The Tysingers are also accused of stealing a set of Duke beverage coasters valued at $12.99.